There is a great number of WordPress themes out there and I see many of them while answering the support tickets. Below you can find a list of the themes I believe to be the best choices for any website. To boost these already fantastic themes, I placed our Smart Slider 3 to all of them. I’ll be honest: I enjoy Divi. 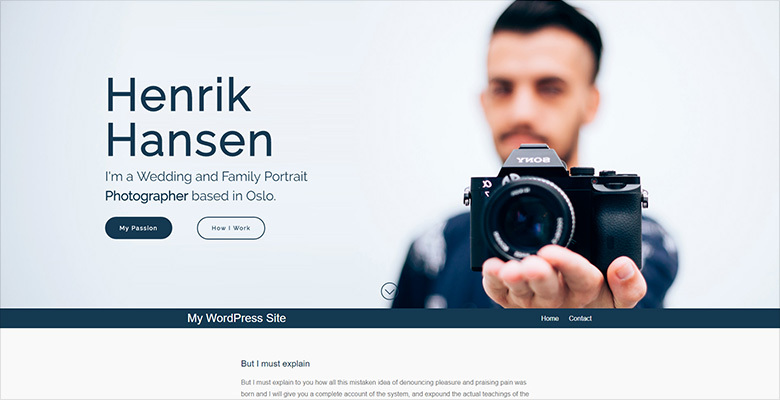 It might not be the most popular WordPress theme (yet) but I found it easy to use and powerful enough to satisfy the needs of every single user who chooses it. My absolute favorite part is that you can add your custom CSS codes to pretty much any module at the Divi Builder itself. The ability to load pre-defined page layouts is a huge plus for starters or people who would like to have nice looking pages very quickly. (Smart Slider 3 has demos that can be loaded similarly.) While loading a predefined Divi layout, it is possible that this layout already has a slider position where you can use our slider module to select your Smart Slider, which is a wonderful tool to use. I dug deeper into Divi, and I had to realize that what I really loved in Divi is actually not the theme itself, but the Divi builder that it’s packed with. Without the Divi builder, the theme doesn’t really offer much, it’s more of an averagely customizable theme that is more useful to developers than to the average user. But hey, we’re living in the era of page builders, so I doubt that having to use a page builder on their site would be a downside for anyone. While writing this article, Divi 3 was released and I had the chance to take a look. The new builder is incredible: it really takes the page building to the next level. It looks great and it’s easier to use than you’d think. 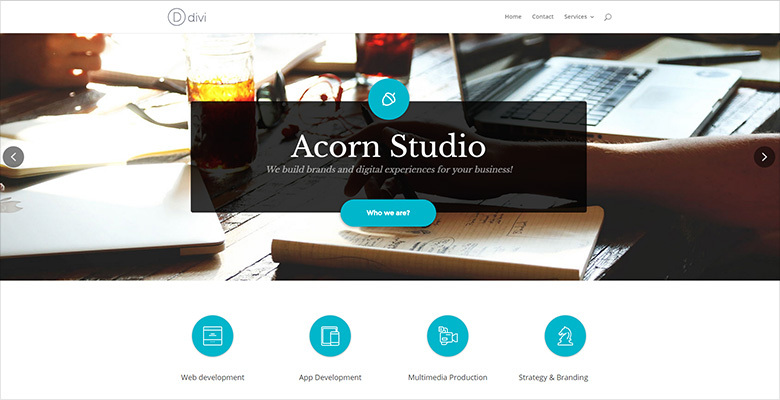 The included Divi Builder has tons of modules to choose from. Huge amount of theme settings are available, and there's a whole panel to make SEO adjustments. Modules can be customized easily and separately. 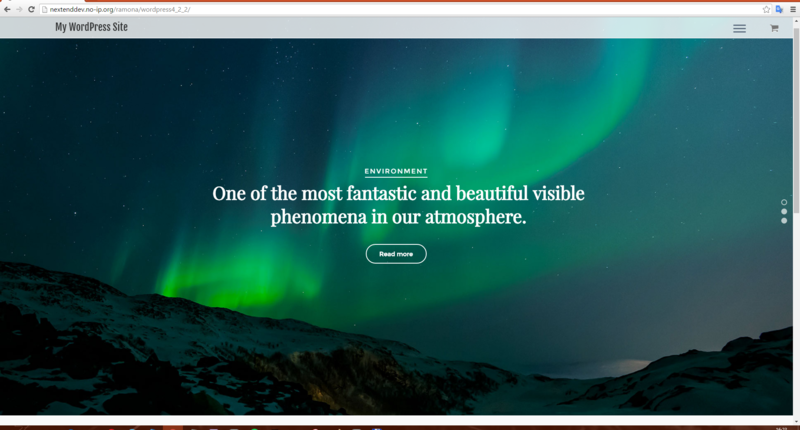 The theme (and the builder) is pretty straightforward, no need to spend great amount of time to learn what setting is placed where to have a nice looking site. The responsive behaviour is pretty good. The yearly subscription is a bit overpriced for one website usage. For an average user (non-coder) there's not much in Divi without Divi Builder. After using Extra, I truly miss the Category layouts. Monstroid is one of the most popular theme by Template Monster. It’s a robust theme offering many features, and the responsive behavior is impressive. The Static Area Builder is a fantastic way to build the header and footer sections of the page. There are many customization options, and while they’re intuitive and nicely structured, when I checked the settings page for the first time for a brief moment it gave me the feeling of “there’s so many things to modify, what should I change first”? However, once I got the hang of it, I found Monstroid easy to use, and it seemed that there isn’t any part of the theme that can’t be customized in their backend interface. The included MotoPress Content Editor to build nice looking pages is easy to use. There are predefined layouts to make the creation process easier. The included MotoPress Slider wasn’t feature rich enough for me, so I immediately switched to Smart Slider 3 and placed our latest demo slider to the theme. The pice is $79 for one website and lifetime updates. They have a developer option, where the theme can be purchased for five domains for $99, which is a killer deal. Good news for all of our readers – they provide a special 30% promo code “TMNEWSLETTER30” on all of their WordPress themes! The code is active till the end of autumn, November 30. So be in time to redeem it in your shopping cart! Every data is included to achieve their demo content easily. They have a written tutorial to help you learn the process. The post or page layout can be changed at each post. Wide variety of social sharing options for posts. Built-in mega menu and lightbox. There are so many options that at first you might get lost. For some reason, I had to save the settings multiple times to get the uploaded logo image appear. When I had the chance to try Avada for the first time a few years ago, it was still a newbie in the WordPress theme market. Back then, I was much of a coder person, who preferred to make all and every modification via CSS files (and directly editing the theme’s code) while Avada was promoted as a “no coding skill required” theme. I remember messing with the settings trying to make simple changes (that should have take less than 5 minutes if I had done them via CSS) but I didn’t really manage to make everything as I wanted to – as I could have done it by CSS coding. This was a bitter experience for me, so when I installed Avada again to write this article, I was a bit nervous. I shouldn’t have been. 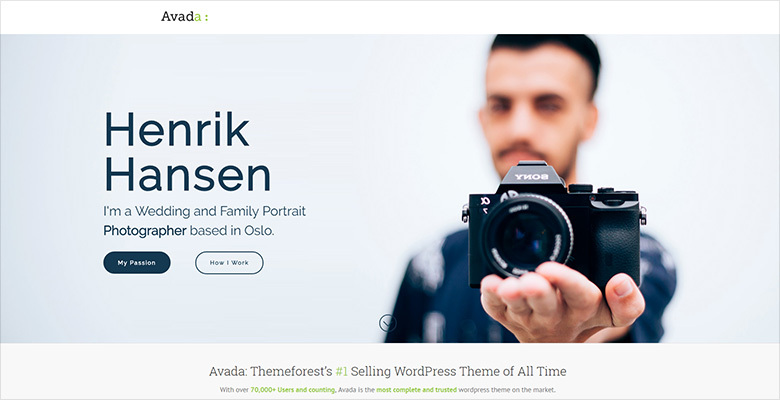 In the past years, Avada, as promoted, did become the “Swiss Army Knife” of WordPress themes. It looks as if everything has changed for the better: it’s easier to make changes, import the sample page, get your site ready to launch. All the negative feelings I had were changed immediately, and all in all I had great experience with the newer Avada. To make it easier to create nice looking pages, Avada comes with Visual Composer, which is an excellent tool. 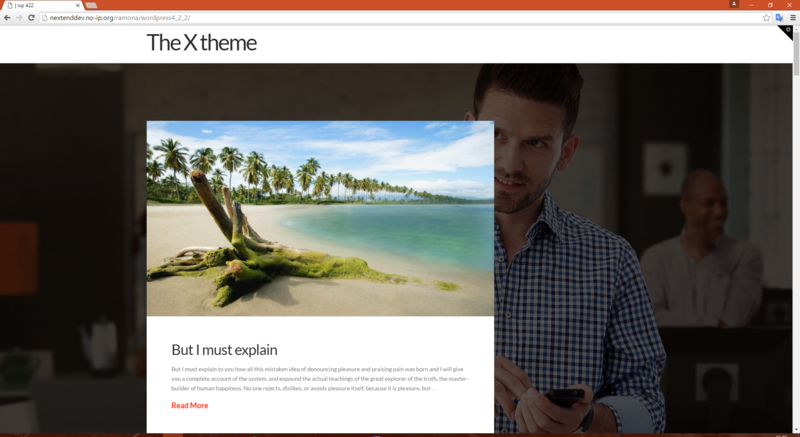 By paying $59 you get the theme for one website for unlimited time (updates included). It comes with 6 month support (for an extra $17.70, it can be extended to 1 year), which might not cover it for some people. If you are a developer and have multiple clients, you will need to purchase a new product for each of your customers, which is not so convenient. Tons of options to customize and configure the theme, but nicely structured. Templates are easy to load. Any kind of website can be built without any coding knowledge, and it doesn't hard at all. An inexperienced user might get lost having that many options. I kind of missed the automatic installation of some demo content (although it can be added later pretty easily), as the first opening of the homepage looked nothing like the demos. While it's easy to use and learn, takes time to master it. 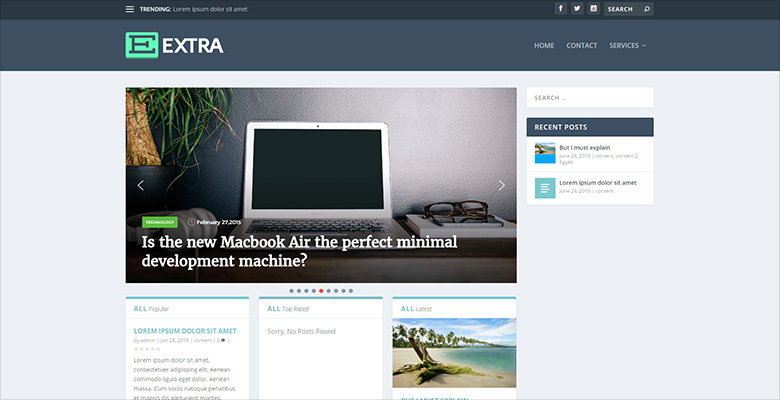 Extra is one of Elegantthemes less famous themes, while it is a really great theme and also uses the Divi builder. 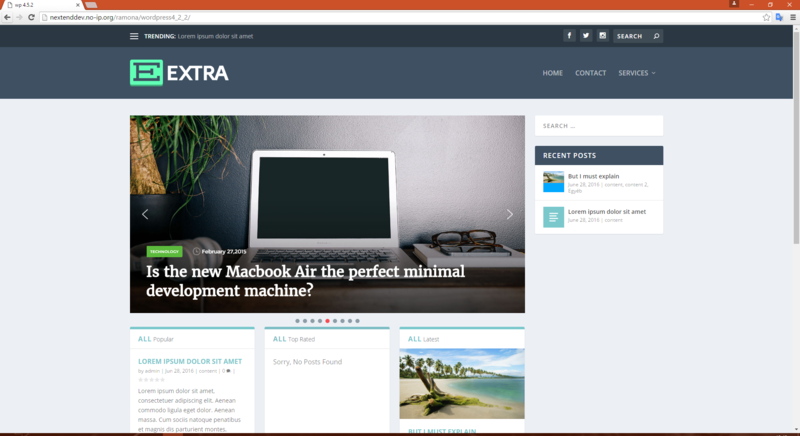 Unlike the multipurpose Divi, Extra is more of a magazine or blog theme. Its main slider is used in a box-like layout, which makes it easy to use Smart Slider’s module in Divi Builder. As much as I love Divi, or more specifically, the Divi Builder (which is included in this theme since it’s ElegantThemes self-developed page builder) I’ve realized I prefer Extra over Divi. Why? Since it has the same page builder to design all of the pages, Extra’s main layout is much more sophisticated, and without Divi Builder, it is much closer to a theme that fits to the needs of the everyday user. It’s also responsive, which is a must-have nowadays. I have the same concerns about the pricing as I have with Divi. The $69/year subscription (althoug it can be used on unlimited websites) is a bit overpriced if you have only one website. 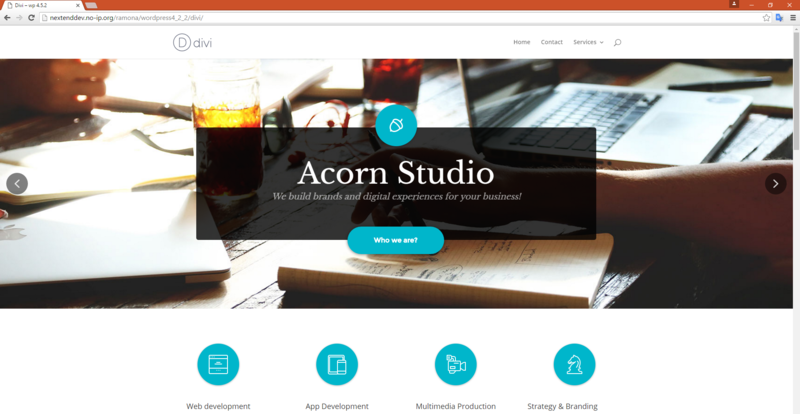 The Divi Builder (bundled with the theme) has tons of modules to choose from. There's a huge amount of theme settings, and a whole panel to make SEO adjustments. It's a pretty nice theme even without the Divi builder. The included Divi builder is easy to use and feature rich. For a single-domain user, the subscription is a bit overpriced. 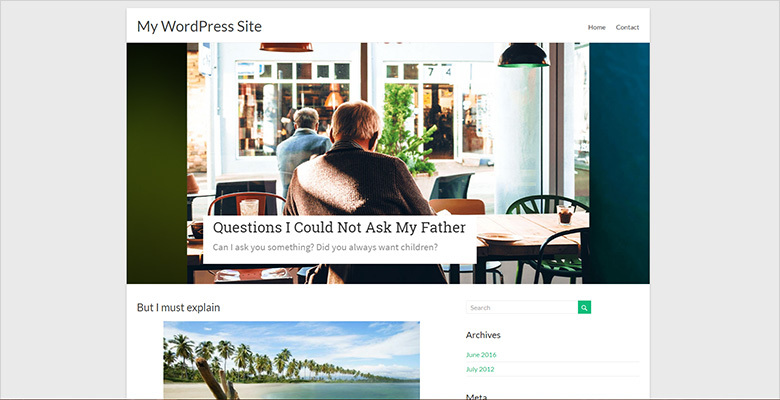 While it can work fine as a business theme, it shines better when used as a blog theme. Which kind of limits the usage. The X is packed with Cornerstone page builder, which (in some ways) similar to Smart Slider 3. Both have a sidebar where the layer & elements are stored that you can put to your slides or pages and an area where you can see how things will look like. Because of this, I found Cornerstone really easy to use and I found my way around pretty quickly. I saw one of the Integrity demos of this theme where the background is a static image, and I immediately thought why not change that static image into a full page slider made in Smart Slider 3? 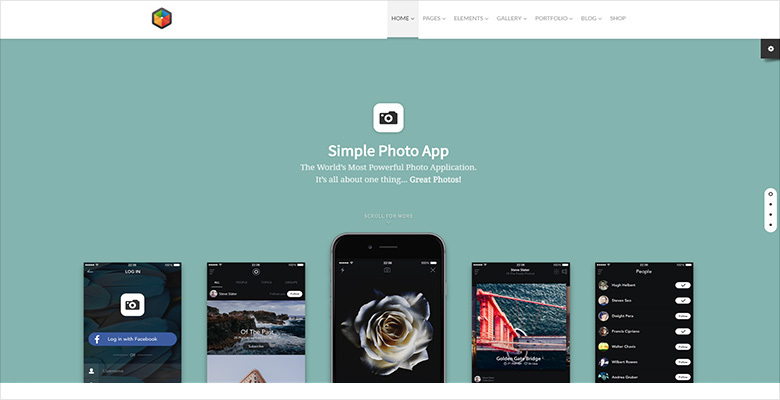 By paying $64 you get the theme for one website for unlimited time (updates included). It comes with 6 month support (for an extra $19.20, it can be extended to 1 year), which might not cover it for people who are not developers. 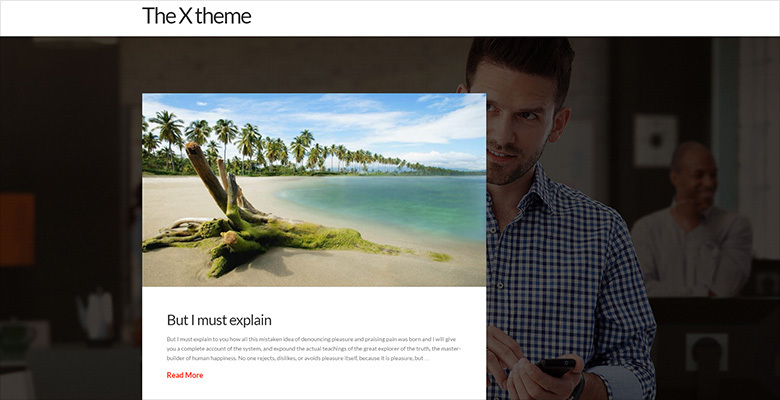 If you would be, you’ll need to purchase the theme for your users over and over again. Templates are easy to load, and everything is pretty easy to customize. 100% responsive and retina-ready. Layouts are easy to customize and highly flexible. A color setting for the widgetbar button icon would have been nice. While the Generate Pro theme does not have a slider by default, I thought it would be nice to replace the default e-mail subscribing form with a Smart Slider that has similar functionality. While the slider is a bit larger than the original form (which can be fixed easily) it does the job nicely. Although, for this one-time purchase, you’ll need to dig deep into your pockets as single theme (plus the framework) costs $99.95. Genesis might not seem be the cheapest theme out there if you need it for your own website (one site), however, it is very flexible and it has huge community of experienced developers on their forums, it is very likely worth the price – but in my opinion, it’s a better choice for developers who don’t mind to roll up their sleeves and code their stuff instead of using some visual editor. Genesis has a bit of learning curve, but there are tons of tutorials (and huge community) to help. It's a one time payment, which is always wonderful. The purchased theme can be used on unlimited number of websites for unlimited time. Tons of features for developers, but a non-coder might have hard time to achieve the look they're looking for. I loved the possibility to set the Featured image size for the blog posts. You need to be a coder to get the most out of this theme. My left-aligned menu somehow become centered around 800px, before going to the "hamburger" mobile menu state at 600px. It's interesting, because on a tablet (portrait mode, 768px), the same "hamburger" menu was showing. 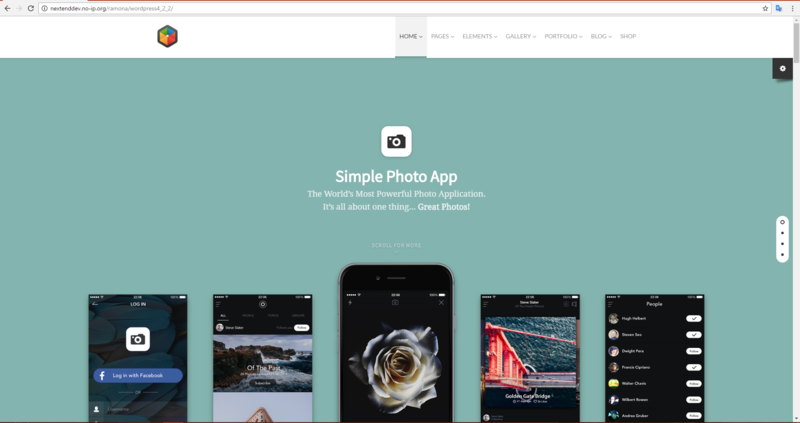 Above we’ve checked a couple of paid themes, so now let’s take a look at a few popular freebie! Tesseract is an extremely popular free theme for your WordPress site. It’s easy to use and customize. By default the theme does not have any slider, but it was really easy to place the slider above into this theme. 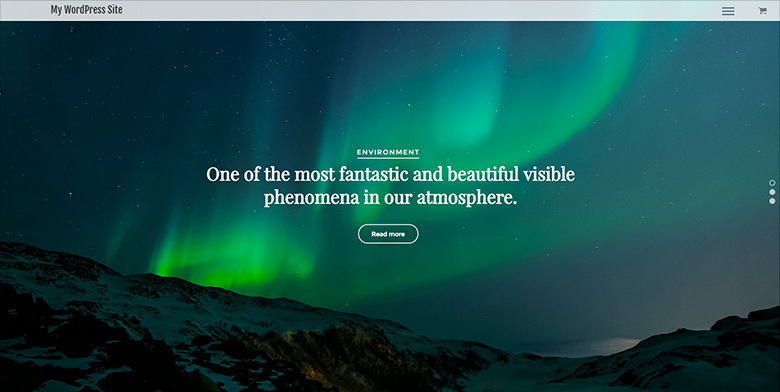 Since the Portfolio demo slider used in this theme has the parallax effect, it looks gorgeous when the menu and the rest of the page covers the slider when you scroll downwards. It's responsive and easy to use. Sometimes the x that closed the mobile menu got under the site title. Spacious is a popular free theme, designed for blog pages. This theme has a simple slider by default (it’s turned off when the theme is installed), but I didn’t really like that as it is pretty simple and doesn’t allow much customization. Hence I placed a showcase slider to this theme which has blog related pages and the result speaks for itself. 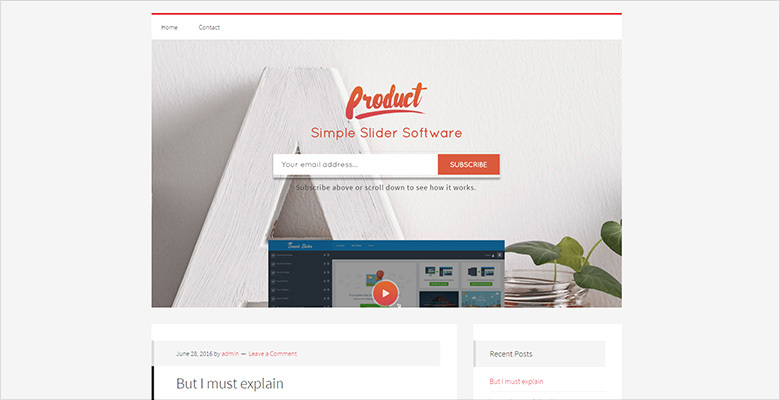 Since this theme was made specifically for blogs, it would worth creating a slider using our WordPress post generator and place that as the main slider. The demo content is available in the pro version only. For a really unique look, you might need to write custom CSS codes. Customizr is another responsive free WordPress theme. It has a built-in skin selector to change the colors in the website, and it has a “random” option that changed the colors on every page load. I found this an interesting feature, although I’m not sure how useful it is when it comes to create a corporate identity to a website. A demo content was installed immediately waiting for me to modify it. Automatic lightbox for the images. When logged in as admin, the theme kept showing tips, e.g. that I haven't set the featured image to the post and things like that. While personally I was bothered by this, it can be still useful for new users. Here it is, the list of the WordPress themes I liked the most in 2016. I didn’t have any problems with any theme listed here or the Smart Slider 3 when I put the slider into any of them. That said, I can happily recommend giving a shot to any of these themes. Would you like to know how did I put the slider to a specific theme? Check out our documentation for step-by-step tutorials. What is your favourite WordPress theme? Let me know in a comment! Are you a Joomla user? Don’t worry, the Joomla template one is on its way, too!